A government health worker at the Kenema Ebola Treatment Centre in Sierra Leone attends to a victim. The United Nations World Health Organization (WHO) today convened a meeting of ethicists and scientists to discuss on the use of experimental medicines in treating Ebola, three days after the agency declared the current outbreak of the disease in West Africa an international public health emergency. WHO Spokesperson Gregory Hartl said via Twitter that the Geneva-based organization is planning a press conference at 2 p.m. Tuesday. 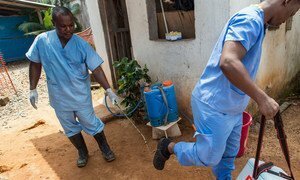 “The recent treatment of two health workers infected with the Ebola virus with experimental medicine has raised questions about whether medicine that has never been tested and shown to be safe in people should be used in the outbreak, and, given the extremely limited amount of medicine available, if it is used, who should receive it,” according to WHO. The virtual meeting today will “develop a framework for how we should approach” the issue of untested drugs “because this is not a single drug issue; it is really a framework, which is potentially applicable to options as they come up… and then we hope that will provide solid directions for how to move on this group of issues,” Dr. Keiji Fukuda, WHO Assistant Director-General for Health Security, had told reporters last Friday. At that time, WHO Director-General Dr. Margaret Chan declared the current outbreak of the Ebola a public health emergency of international concern, endorsing the unanimous recommendation made by Emergency Committee of International Experts on the current Ebola outbreak in Guinea, Liberia, and Sierra Leone, and which has now spread to Nigeria. Regarding the issue of temporary travel bans, the Committee declared: “There should be no general ban on international travel or trade” but recommended restrictions regarding the Ebola-affected travellers. “Our collective health security depends on support for containment in support in these countries,” Dr. Chan said on Friday.